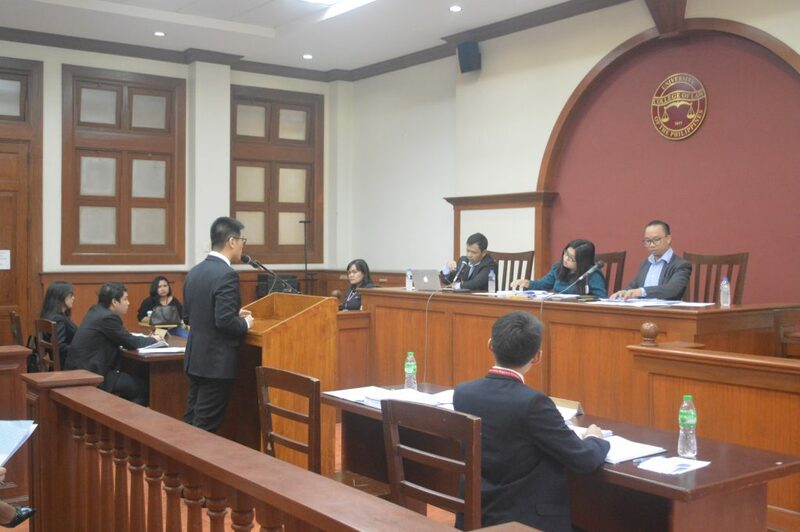 The University of the Philippines Law Center through its Institute for Maritime Affairs and Law of the Sea (UP-IMLOS) and Institute for International Legal Studies (UP-IILS), hosted the Southeast Asian Regional Rounds (“SEARR”) of the 23rd Stetson International Environmental Law Moot Court Competition (“Stetson”) last January 8 to 10 at the UP College of Law. 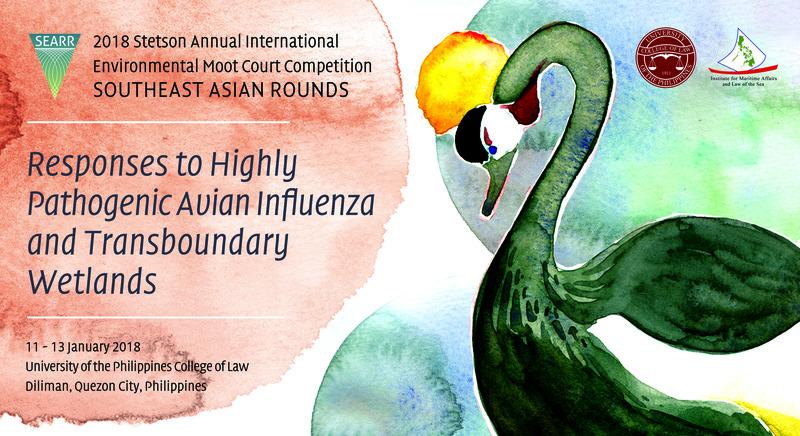 The Stetson is the most prestigious international environmental law moot court competition that focuses on the legal aspects of global environmental challenges. 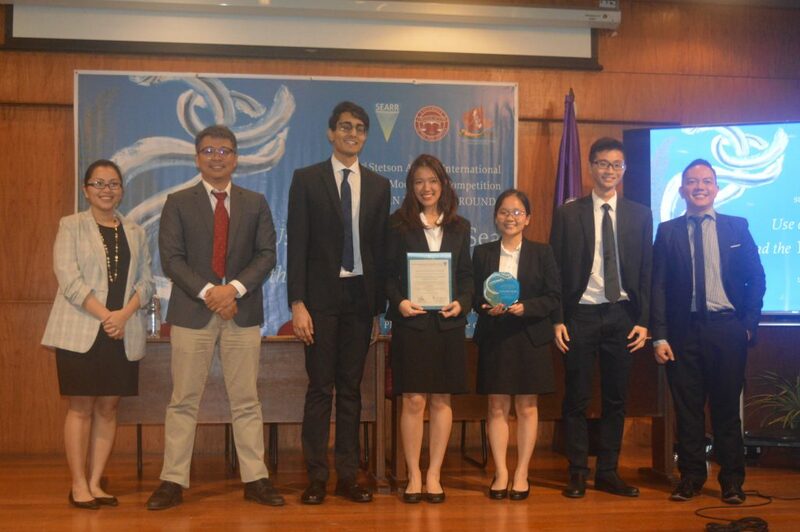 One of two student teams representing the National University of Singapore bagged the championship during the Stetson SEARR. 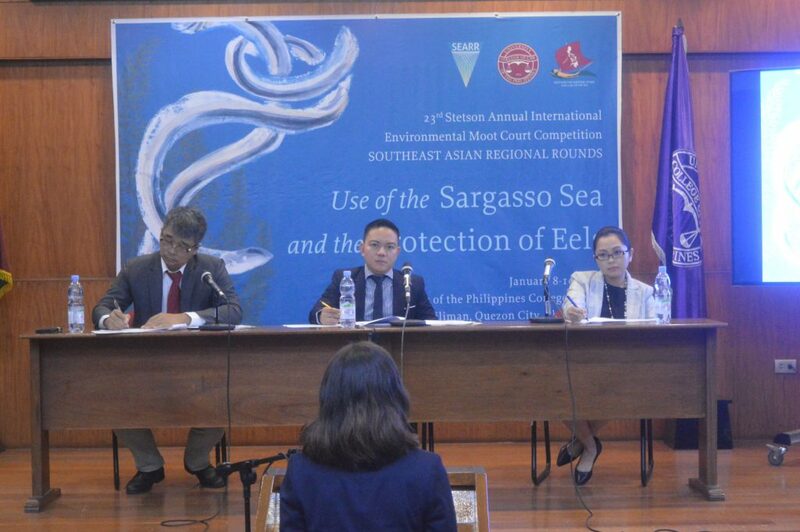 This year’s competition centers on the “Use of the Sargasso Sea and the Protection of Eels”, involving coastal States’ responsibilities under international environmental treaties. These include the Convention on Biological Diversity (CBD), Convention on Migratory Species (CMS), UN Convention on the Law of the Sea (UNCLOS), UN Framework Convention on Climate Change (UNFCCC), and the Paris Climate Agreement. 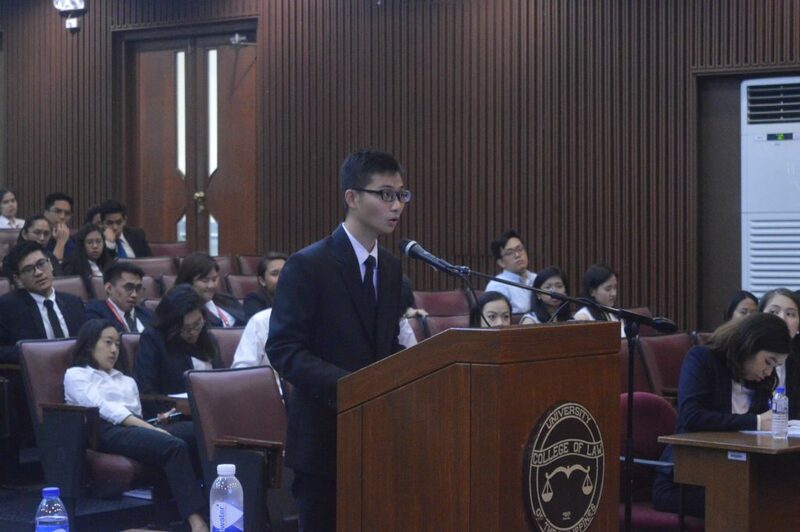 A total of 14 teams participated in the Stetson SEARR, hailing from law schools in the Philippines, Singapore, Malaysia, and Thailand. Four of these teams will be moving on to compete in the International Final Rounds of the Stetson Competition in Gulfport, Florida, namely, the University of the Philippines, University of St. La Salle, and two teams from the National University of Singapore (NUS). 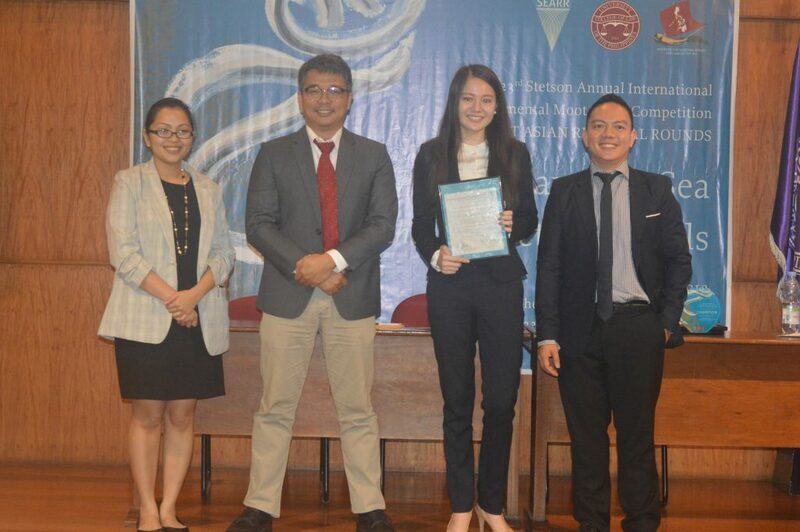 Next to NUS’ Applicant Team, the University of the Philippines emerged First Runner-Up of the competition, with mooter Camille Angela Santana Cruz receiving the award for Best Speaker in the Final Round. Awards for the top five speakers during the preliminary rounds were also given to the following, ranked first to fifth: Danelle Leigh Pandan Villadolid (University of St. La Salle), Mark Brainwin Lora Que (Ateneo Law School), Lcid Crescent De La Gente Fernandez (University of San Agustin), Princess Joy Quinto (Lyceum of the Philippines University),and Daniel Victor Labrador Zayco (University of St. La Salle). 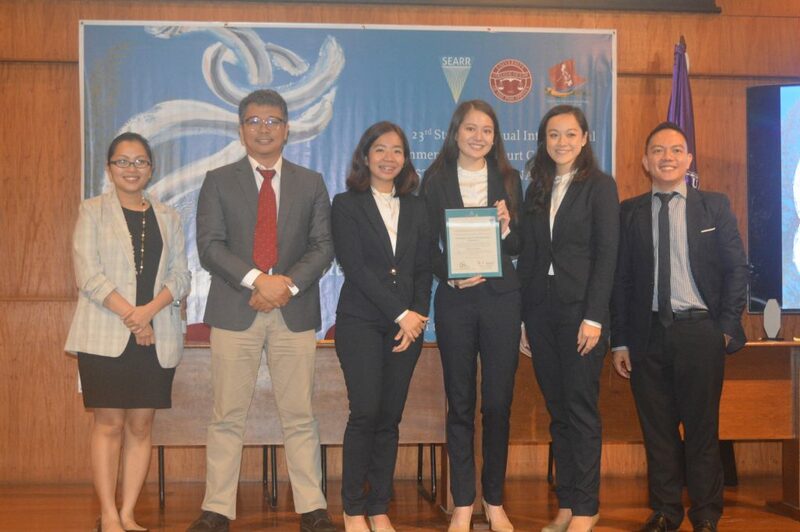 The Ateneo Law School also received an award for submitting the Best Memorial, followed by the NUS Applicant Team, and the University of the Philippines. The International Final Rounds of Stetson will be held in Gulfport, Florida on April 11-13, 2019. This entry was posted in News and Updates and tagged 2019, moot, SEARR, Stetson, Stetson SEARR on January 24, 2019 by Institute for Maritime Affairs and Law of the Sea. 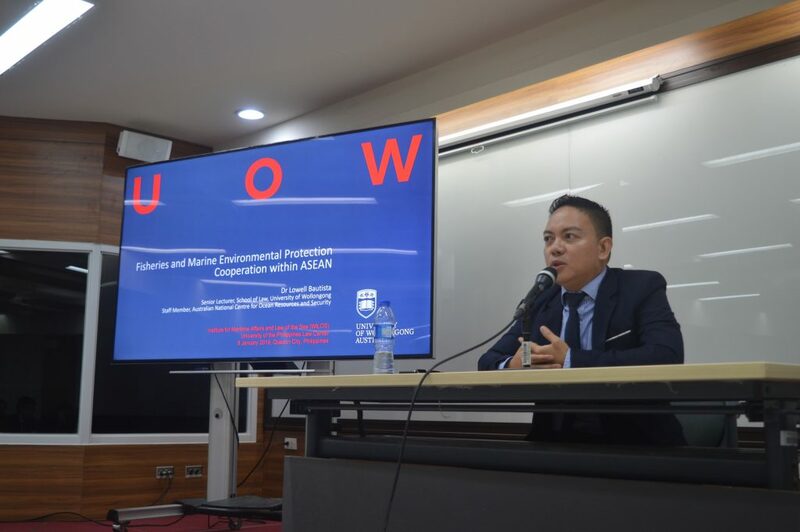 The UP Institute for Maritime Affairs and the Law of the Sea kicked off its activities for 2019 with a public lecture on “Fisheries and Marine Environment Protection Cooperation within ASEAN” by ocean affairs expert Dr. Lowell Bautista, last January 9, 2018 at the UP Law Center. Dr. Bautista is presently affiliated with the Australian National Centre for Ocean Resources and Security (ANCORS), and is a Senior Lecturer and Head of Students at the University of Wollongong. 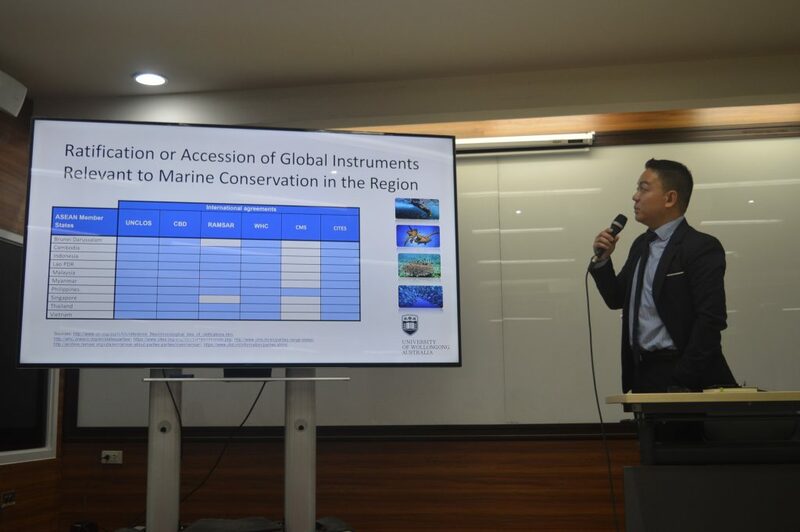 During the lecture, Dr. Bautista discussed the global and regional legal and institutional framework on fisheries and marine environmental protection, focusing in particular on different mechanisms existing within the ASEAN. 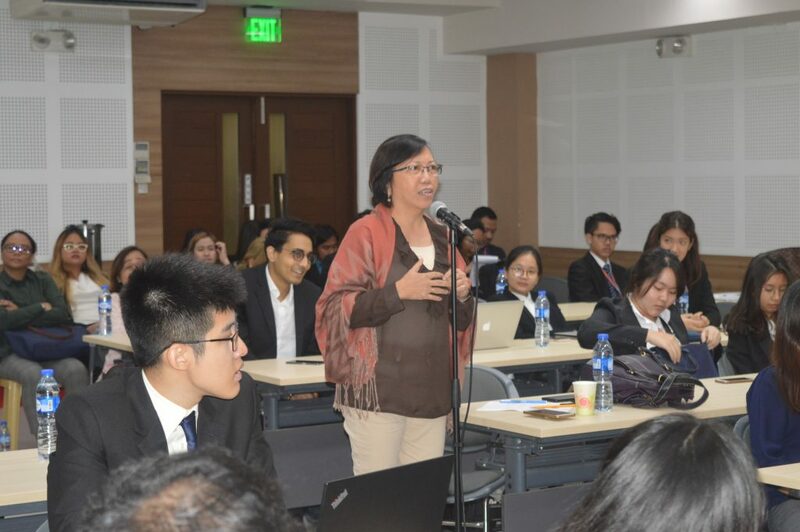 Examining the current situation and strategic realities of the Southeast Asian region, Dr. Bautista pointed to the absence and desirability of a comprehensive, integrated, legally-binding, and overarching marine environmental regional framework. Lack of the same renders compliance merely voluntary and highly dependent on a State’s resource capacity. The region’s political and economic situation also impedes environmental cooperation. 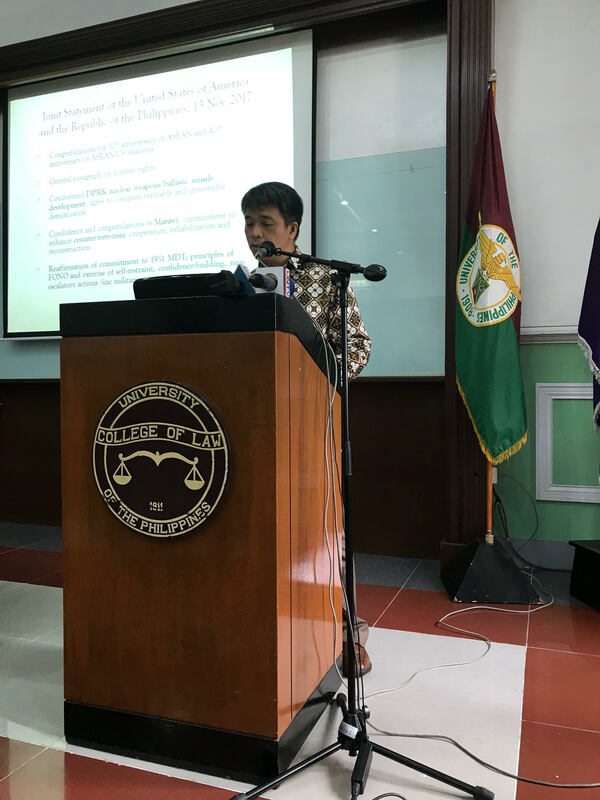 Dr. Bautista thus emphasized the need to translate regional programs and projects into national policies that are adequate and effective,in view of the fact that the current legal framework for transboundary fisheries governance is either ad hoc, sectoral, or species-based. 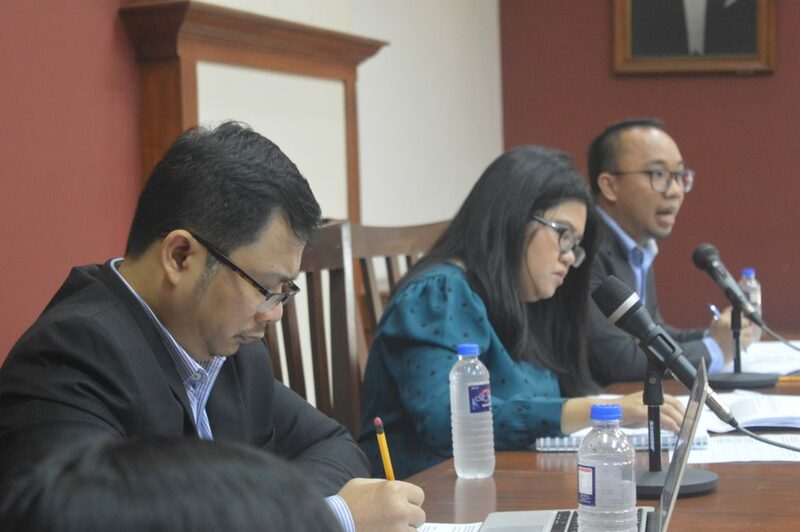 The public lecture was attended by members of different government institutions, non-government organizations, and participants from different law schools competing in the Southeast Asian Regional Rounds of the 23rd Stetson Annual Environmental Moot Court Competition. 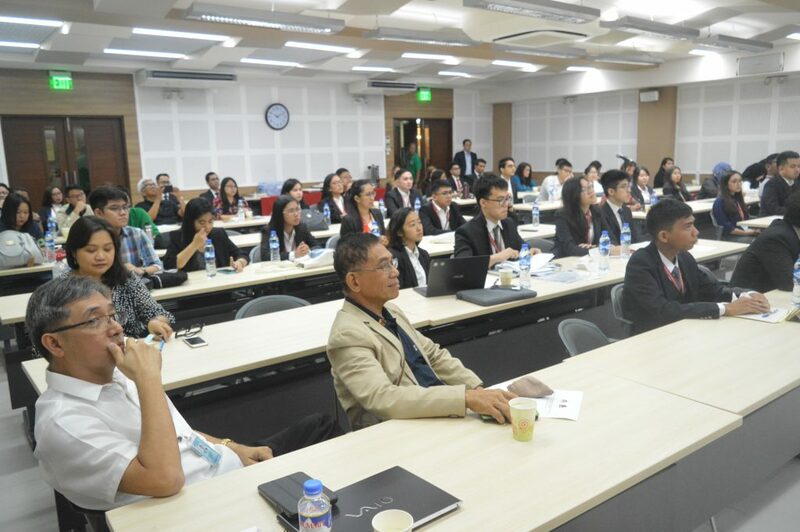 A graduate of the UP College of Law prior to his Master of Laws and Doctor of Philosophy degrees from Dalhousie University (Canada), and the University of Wollongong, respectively, Dr. Bautista regularly advises the Philippine and Australian governments on issues relating to offshore oil and gas resources, the law of the sea, and maritime boundary delimitation, among others. 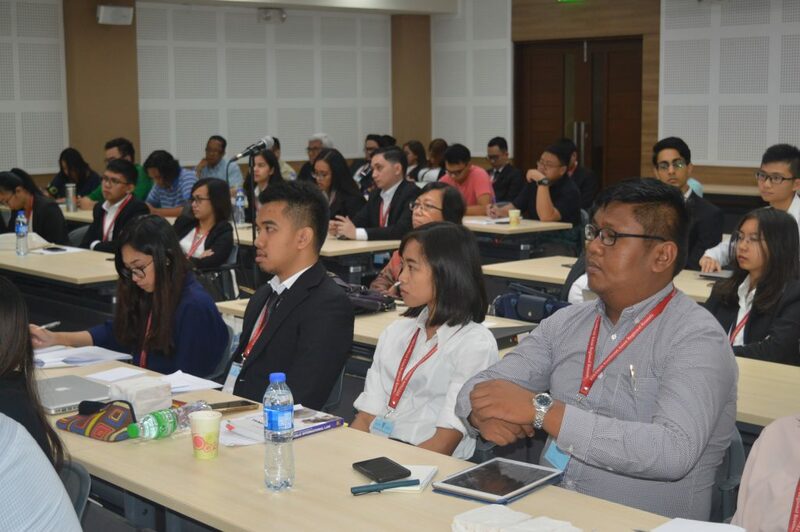 This entry was posted in News and Updates and tagged lecture, marine environmental protection on January 24, 2019 by Institute for Maritime Affairs and Law of the Sea. Mr. Poling oversees research on U.S. foreign policy in the Asia Pacific, with a particular focus on the maritime domain and the countries of Southeast Asia. His research interests include the South China Sea disputes, democratization in Southeast Asia, and Asian multilateralism. Mr. Poling’s writings have been featured in the Wall Street Journal, Nikkei Asian Review, Journal of Political Risk, and YaleGlobal, among others. He is the author of The South China Sea in Focus: Clarifying the Limits of Maritime Dispute (CSIS, July 2013) and coauthor of multiple works including Building a More Robust U.S.-Philippines Alliance (CSIS, August 2015), A New Era in U.S.-Vietnam Relations: Deepening Ties Two Decades after Normalization (CSIS, June 2014), and A U.S.-Indonesia Partnership for 2020: Recommendations for Forging a 21st Century Relationship (CSIS, September 2013). Mr. Poling received an M.A. in international affairs from American University, a B.A. in history and philosophy from St. Mary’s College of Maryland, and studied at Fudan University in Shanghai. 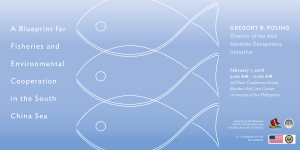 This entry was posted in and tagged cooperation, Environment, Fisheries, South China Sea on February 1, 2018 by Jacqueline Espenilla. China has openly identified marine science and technology through the conduct of marine scientific research (MSR) as vital for the development of maritime power, and has laid out a roadmap to 2050 outlining the means and methods for doing so. To this end, it has invested heavily in its academic and research institutions, fully modernized and upgraded its MSR vessels into the largest and best in the world, and embarked on national and international ocean research programs. It has 46 vessels already in operation, with more being built and pressed into service. The most modern ship, the Xiang Yang Hong 01, is a globally-mobile ocean laboratory capable of long-range voyages and deep-sea research, and if necessary can be operated by one person on the bridge. 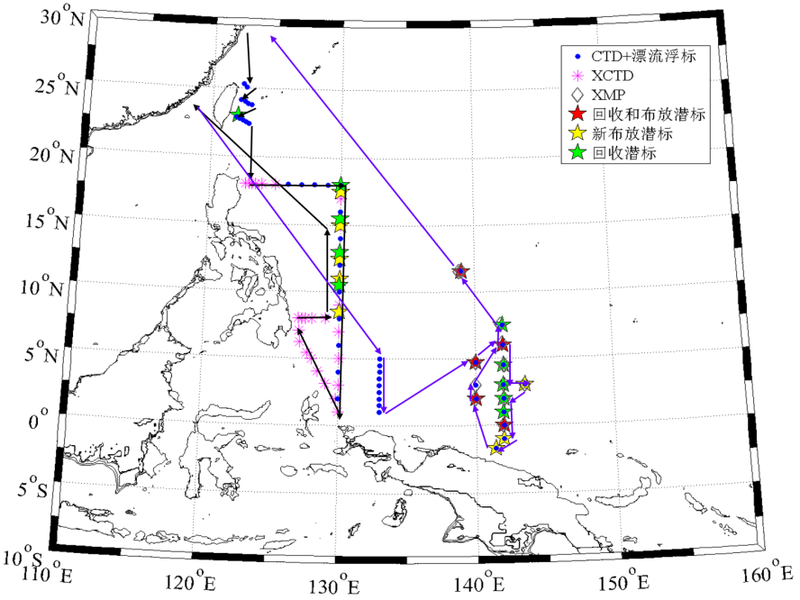 Alarm over the grant of consent for conduct of MSR by the Institute of Oceanology of the China Academy of Science, subject to the condition that it partner with the University of the Philippines’ Marine Science Institute, is perfectly understandable given China’s spotty record in demonstrating respect for Philippine jurisdictions and its expansive maritime claims in the West Philippine Sea. Since 2016, a marked increase in MSR activities in the WPS have raised suspicions that China is deploying these vessels as a “grey zone tactic” to assert and demonstrate jurisdiction and administration of its claimed waters. The PRRD Administration’s quiescence in the face of this increased activity, which included surveys and use of submersibles in areas around the Kalayaan Islands, Scarborough Shoal, and Reed Bank has done nothing to assure Filipinos of the government’s insistence that it continues to protect its maritime interests. International law does not sanction (and even expressly proscribes) the use of MSR activities as a means of asserting and proving sovereignty and jurisdiction over maritime space. But this has not prevented suspicion over China’s objectives, hence, even more intense suspicions were raised once Chinese MSR activities began intensifying on the Pacific seaboard as well. 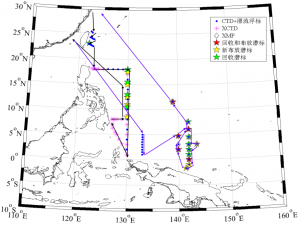 This entry was posted in IMLOS Commentaries and tagged Benham Rise, China, marine scientific research on January 24, 2018 by Jacqueline Espenilla. This entry was posted on January 11, 2018 by Institute for Maritime Affairs and Law of the Sea. 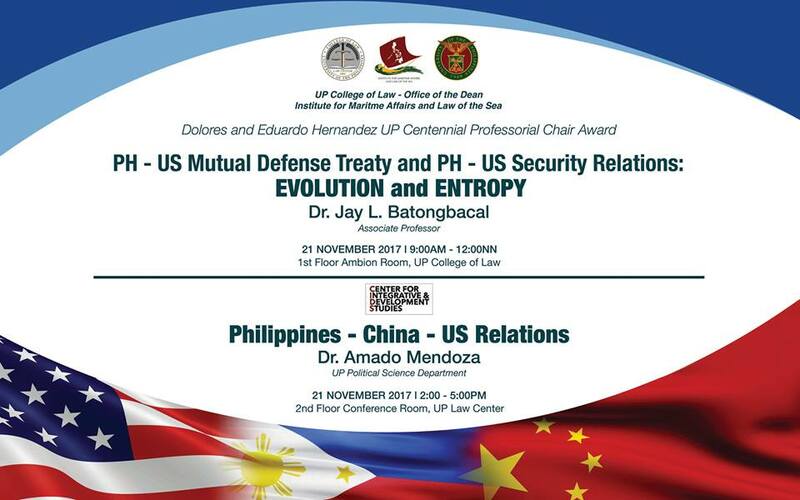 Defense Treaty and Philippines – United States Security Relations: Evolution or Entropy”. 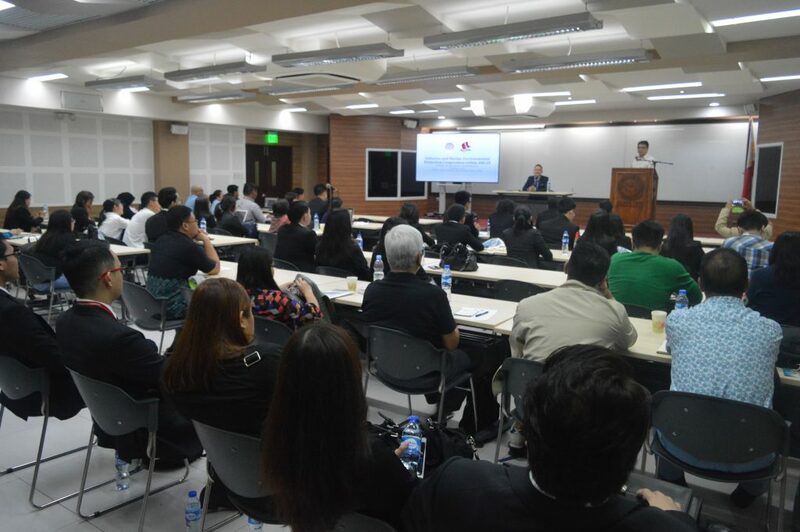 In the afternoon of the same date, Dr. Amado Mendoza of the UP Political Science Department delivered a counterpoint lecture on “Philippines – China – US Relations” and its political implications. This entry was posted in Past Events and tagged China, IMLOS, security, United States on January 3, 2018 by Institute for Maritime Affairs and Law of the Sea. Benham Rise is an underwater plateau that stretches from the coast of Cagayan and Bicol up to approximately 300-350 nautical miles (nm) in the Pacific Ocean. 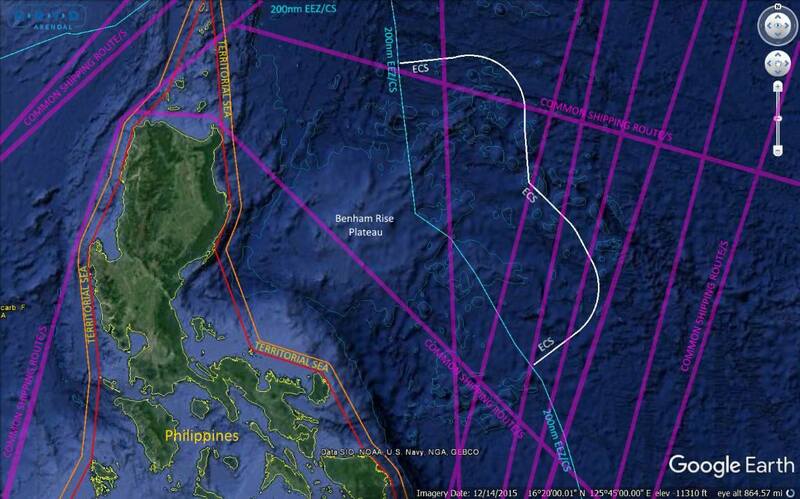 A large part of this plateau is within the 200 nm Exclusive Economic Zone and continental shelf of the Philippines. 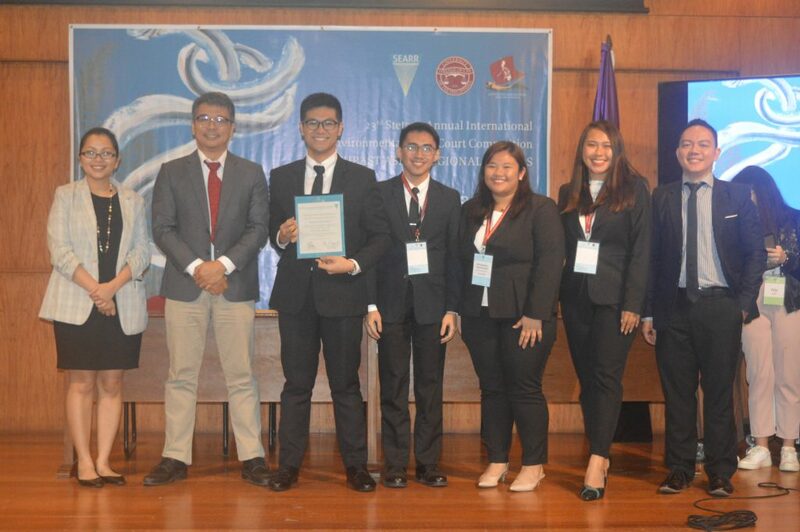 An additional area of seabed extending around 150 nm was successfully claimed by the Philippines as its “extended continental shelf” (ECS) in accordance with Article 76 of the UN Convention on the Law of the Sea. 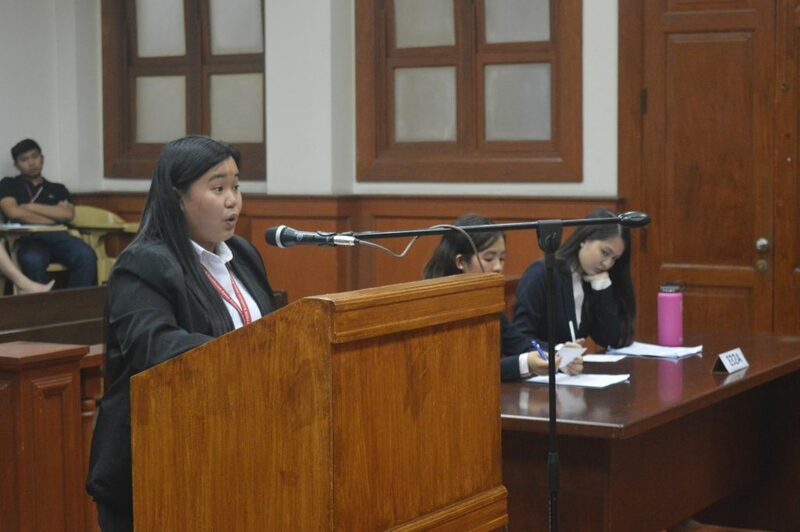 The region may not be “territory” in the same sense as land territory, but it is definitely “territory” for the purposes of Philippine laws and regulations over natural resources. The 1987 Constitution considers as legally part of the National Territory all areas over which the Philippines has sovereignty or jurisdiction; Benham Rise falls squarely within this definition. Within 200 nm, the Philippines has exclusive sovereign rights to explore for, and exploit, living and non-living natural resources of both the water column (the EEZ) and the seabed beneath (the continental shelf). “Sovereign rights” may not be the same as full “sovereignty”, and people usually confuse these two terms. It is like confusing a person’s rights over property he holds under lease and rights to property he holds as a full owner. But the fact that the former is of a different status than the other does not make them any less enforceable under law. These waters are subject to high seas freedoms available to all nations (including freedom of navigation and overflight), but such freedoms must be exercised in a way that respects, and gives due regard to, the sovereign rights of the Philippines. In addition, the Philippines has the right to regulate and participate in any marine scientific research (MSR) conducted in this area. Beyond 200 nm, but within the area of the ECS, the water column is considered to be part of the high seas subject to the common rights and freedoms of all States. But the seabed underneath is still subject to the exclusive sovereign rights of the Philippines for purposes of exploration and exploitation of seabed resources. No other State may carry out activities for these purposes in the seabed in this area, even though they may exercise rights and freedoms on the waters above it. This is the area that was recognized by the Commission on the Limits of the Continental Shelf (CLCS) to be the Philippines’ ECS. The reported activities of China therefore have to be viewed with an eye for careful legal nuances. SND Lorenzana described Chinese survey vessels to have been passing through, or to have been stationary for extended periods of time, or moving in a criss-cross/back-and-forth pattern. Naturally he cannot describe in detail what these vessels were doing, he can only see how the vessels are moving. But that is enough to make some reasonable assumptions. Even without direct visual sighting, the movement of a ship (such as that recorded on a radar plot, or by satellite) tells a lot about its activities. The first point is this: a vessel is merely passing through if it is moving at a steady pace in one direction, obviously travelling from a distinct place of origin to a specific destination. UNCLOS Part II guarantees the right of foreign vessels to pass through the waters of coastal States subject to certain rules. If it is moving through territorial waters (i.e., within 12 nm from shore) its right to do so is guaranteed by the “right of innocent passage.” Beyond territorial waters, i.e., in the EEZ and high seas, it does so in exercise of “freedom of navigation,” likewise guaranteed by UNCLOS, but such freedom of navigation, by its very name, refers only to the act of navigating on water. It does not connote freedom to undertake any other activity. Such other activities will be governed by the rules applicable to either the EEZ or the high seas, wherever the ship may be located at the time. This takes us to the second point: within the EEZ of a coastal State, a ship exercising freedom of navigation must respect the exclusive sovereign rights of the coastal State to its EEZ and continental shelf. These rights of a coastal State include regulatory jurisdiction over activities which have the purpose of exploring and exploiting the living and non-living resources of the water column and the seabed within 200 nm from shore. These are guaranteed by UNCLOS Part V and VI. They also include regulatory jurisdiction over activities that fall within the purview of “marine scientific research.” This is governed by UNCLOS Part XIII. While the extent of coastal State jurisdiction varies, they all require the basic element of coastal State consent. A ship may be assumed to be doing more than exercising freedom of navigation if it is moving in a way that is not in accord with the general objective of navigation: to get from one place to another. If, for example, a ship becomes stationary for a long period of time in one place, either keeping in one specific spot or drifting somewhat, before again moving purposely, or doing so repeatedly, it is reasonable to assume that it is not merely navigating. It is likely doing something else, such as taking soundings, dropping probes, deploying divers or remotely-operated vehicles, or some other activity that requires the ship to stop navigating. If a ship moves in a direction that is not a straight line, it does so not merely to navigate, but in connection with another activity entirely. 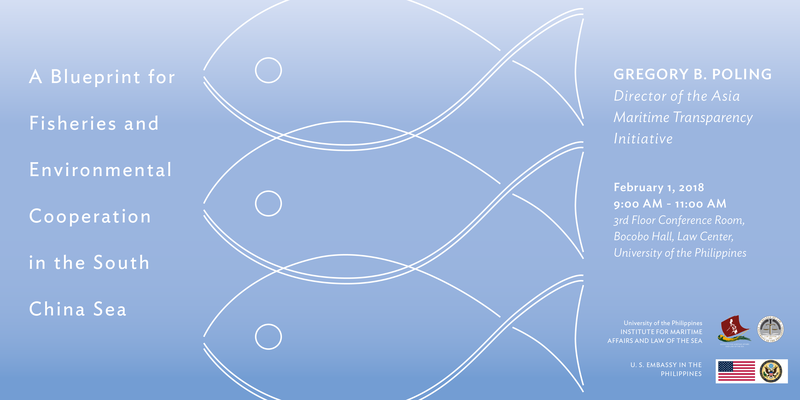 If it is moving in circular, zigzagging, or other irregular patterns, it is reasonable to assume that it is chasing fish (or some other object), or actually fishing (or something similar), or doing something else entirely (like military exercises). If it is moving in a regular criss-crossing or back-and-forth pattern at regular intervals, it is likely mapping the ocean floor with sonar or other device. All of these activities indicate that the ship is not merely passing through (i.e., exercising either the right of innocent passage or the freedom of navigation) but is actually doing something else: either marine scientific research, or military activities such as exercises or hydrographic/oceanographic surveys. It becomes even more probable if the ship either returns to its port of origin, or goes to another place that it could have gotten to very easily and in far less time had it not carried out its various movements. Bringing the situation back to Benham Rise, see the graphic provided. This entry was posted in IMLOS Commentaries and tagged Benham Rise, China, Territory on January 3, 2018 by Institute for Maritime Affairs and Law of the Sea. This entry was posted in and tagged China, cooperation on December 6, 2017 by Jacqueline Espenilla. This entry was posted on November 21, 2017 by Institute for Maritime Affairs and Law of the Sea. This entry was posted on November 21, 2017 by Jacqueline Espenilla.